Time for a sneak peek at one of the many really great items in the new Occasions Catalogue - available 5 January 2016. This is the Bloomin' Love stamp set and the Bloomin' Heart thinlits dies which are available as a bundle at a saving of 15%. This is in fact a gift card - I didn't take a picture but inside there is a pop up gift card holder. It's amazingly sparkly and over-the-top but I think just right for a Christmas gift card present for my lovely niece. The main card is made from Blushing Bride cardstock to which I've added a layer of Cherry Cobbler. I stamped an image in black ink from another new stamp set called First Sight and then I mirror stamped it on the other side. Once the ink was dry I added a little sparkle with the Wink of Stella Clear brush (also in the new Occasions Catalogue). I used the Bloomin' Heart thinlit die to cut the large heart from Dazzling Diamonds Glimmer Paper. 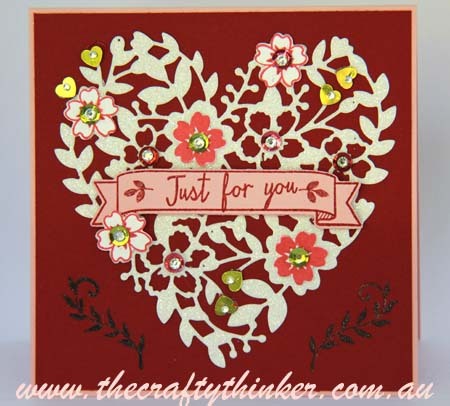 I stamped the flowers from the Bloomin' Love stamp set onto Whisper White cardstock with Watermelon Wonder ink and cut them out with the small dies from the Bloomin Heart Thinlits and stuck them onto the larger heart. I stamped the banner from the Bloomin' Love stamp set in Cherry Cobbler ink onto Blushing Bride cardstock and added a sentiment from Watercolor Wings (currently available in the Annual Catalogue). 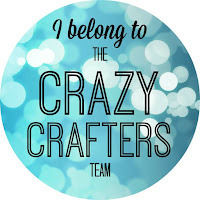 Then I cut out the banner with the matching die from the Large Numbers Framelits die set and stuck it onto the heart. The finishing touches were the sequins from the Brights Sequin Assortment and I placed a small Rhinestone Jewel (both currently available in the Annual Catalogue) in the centre of each.